For the printing of postcards we are able to offer the best thanks to “sublimate”, a new screening technology of home Agfa *, capable of increasing the quality of printing of postcards with a perfect control during printing. This gives the images printed catalogs greater depth and tonal control never seen before. We can provide printing postcards in various types and sizes and in various types of processing (lamination, UV verniciture. Etc.) 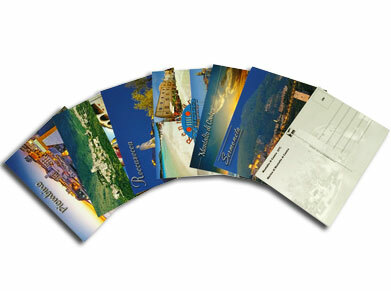 Ensuring to our customers any type of solution for the supply of postcards. Standard sizes finished: 10 cm × 15, 11 × 16, 12 × 17, 11 × 23, 11 × 30. Treatments: gloss lamination, UV coating glossy, glossy UV coating to areas in cellophane packs of 100 pcs., Hot stamping or embossing. The birth of the postcard from the second half of the nineteenth century, by an official of the Prussian Heinrich von Stephan asked. The first cards had a white side where you could write your message, and one side printed with the image of the stamp. Only in 1885, were born in Austria the first printed cards, when it was granted to private individuals the ability to print postcards. In Italy in 1882 were printed postcards with views prepared by the painter Baldassare Surdi. On 19 September 1895 the first postcard is printed with official printed illustrations, commemorating the twenty-fifth anniversary of the liberation of Rome. Last step to get to the modern postcard was the introduction (in Britain in 1902), the “divider back”, which divides, even today, the back of the card in two parts, one for the address and postage and the other for the message.